Scientists have created the first map that shows how the Greenland Ice Sheet has moved over time, revealing that ice in the interior is moving more slowly toward the edges than it has, on average, during the past 9,000 years. The findings, which researchers said don’t change the fact that the ice sheet is losing mass overall and contributing to sea level rise, are published in the Feb. 5, 2016 issue of Science. Along Greenland’s periphery, many glaciers are rapidly thinning. However, the vast interior of Greenland is slowly thickening, and this new study clarifies what is happening there. “Scientists are very interested in understanding how ice sheets flow and how that flow may have been different in the past. 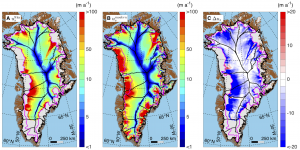 Our paleo-velocity map for Greenland allows us to assess the flow of the ice sheet right now in the context of the last several thousand years,” said lead author Joe MacGregor, of The University of Texas at Austin’s Institute for Geophysics (UTIG), a research unit of the Jackson School of Geosciences. The study builds on earlier UTIG-led research that developed a database of the many layers within Greenland’s ice sheet. Using this database, the scientists determined the flow pattern for the past 9,000 years — in effect creating a “paleo-velocity” map. In comparing the paleo-velocity map with modern flow rates, researchers found that the ice sheet’s interior is moving more slowly now than it was during most of the Holocene, a geological period that began about 11,700 years ago and runs to the present. “Like many others, I had in mind the ongoing dramatic retreat and speedup along the edges of the ice sheet, so I’d assumed that the interior was faster now too. But it wasn’t,” said MacGregor. Greenland’s average ice speed over the last nine thousand years (left), its current speed (center) and the difference between them (right). Blues (negative values) signify lower speeds today as compared to the nine-thousand-year average. The authors identified three causes for this deceleration. First is that snowfall rates were generally higher during the past 9,000 years, second is the slow stiffening of the ice sheet over time, and third is the collapse of an “ice bridge” that used to connect Greenland’s ice to that on nearby Ellesmere Island. Of most interest were the last two. “The ice that formed from snow that fell in Greenland during the last ice age is about three times softer than the ice being formed today,” according to William Colgan of York University’s Lassonde School of Engineering, a co-author of the study. Because of this difference, the ice sheet is slowly becoming stiffer. As a consequence, the ice sheet is flowing more slowly and getting thicker over time. 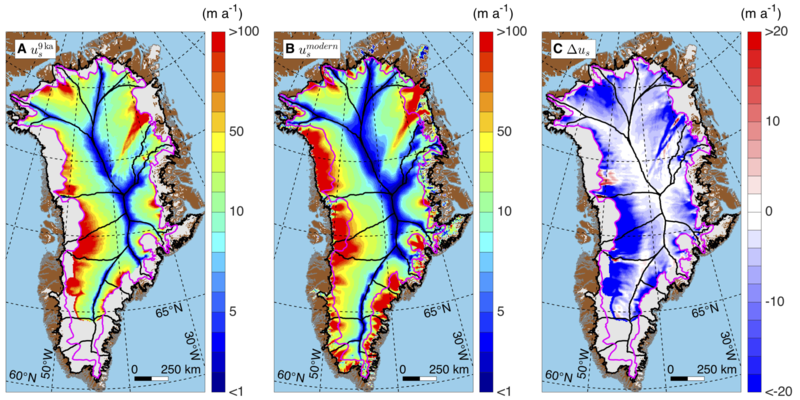 This effect is most important in southern Greenland, where higher snowfall rates have led to rapid replacement of ice from the last glacial period with more modern Holocene ice. “But that didn’t explain what was happening elsewhere in Greenland, particularly the northwest, where there isn’t as much snowfall, so the stiffening effect isn’t as important,” said MacGregor. The explanation of deceleration in the northwest lies in the collapse 10,000 years ago of an “ice bridge” across Nares Strait, which used to connect Greenland’s ice to that on Ellesmere Island. The collapse of the ice bridge at the end of the last ice age led to acceleration in the northwest, but the ice sheet has since returned to a slower pace. These changes, which started thousands of years ago, affect our understanding of the changing Greenland Ice Sheet even today. Scientists often use GPS and altimeters aboard satellites to measure the elevation of the ice surface and study how much mass is being lost or gained across the ice sheet. When correcting for other known effects on the surface elevation, any leftover thickening is assumed to be due to increasing snowfall, but this study shows that may not be the case. UTIG researcher Ginny Catania and scientists from University of Alaska Fairbanks, University of California Irvine and The University of Kansas worked on the study. 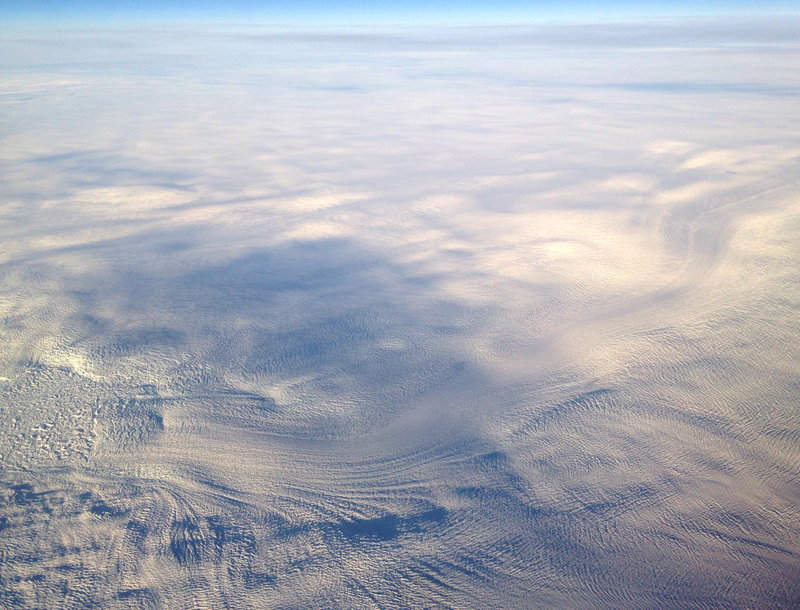 This study was supported by the National Science Foundation’s Arctic Natural Sciences Program, the Center for Remote Sensing of Ice Sheets, and NASA’s Operation IceBridge. The full text of the study can be viewed by visiting the Science Magazine website.